In remembrance of the events that took place in New York City on September 11, 2001, take this guided, 1.5-hour tour of the Ground Zero Museum Workshop. See and touch hundreds of images and artifacts from the 9/11 recovery and experience the heroic efforts of the New York City Fire Department. Listen to audio stories with Bose surround sound headphones and real Ground Zero sound effects. Audio stories and interactive exhibits make this tour ideal for those traveling with kids. To see images and artifacts from 9/11 is one thing. To touch them and to be able to hear their stories is quite another. Do both at the Ground Zero Museum Workshop in remembrance of the tragic events that took place in Lower Manhattan on September 11, 2001. This is not the National September 11 Memorial and Museum near the new Freedom Tower in Lower Manhattan. This award-winning museum is located in the historic Meatpacking District. It lets visitors see what it was like to be on the front lines with FDNY firefighters after the 9/11 attacks and to experience the aftermath at Ground Zero through the lens of official Ground Zero photographer of FDNY, Gary Marlon Suson. See the largest piece of World Trade Center window glass in existence and the Frozen Clock, which is stuck at 10:02 a.m., the precise time the South Tower collapsed. There’s the famous Genesis 11 charred Bible page plus a collection of images described as “rare” by the New York Times because they can only be seen at this location. There are also 3-D photo installations that place visitors into the hole that was left at Ground Zero. 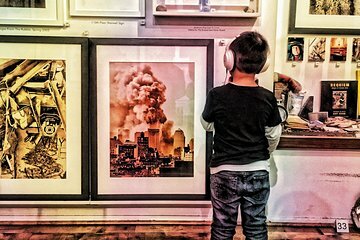 This kid-friendly museum is a great way for parents to teach their children about the 9/11 attacks in a gentle manner. The museum doesn’t focus on the day of the attacks but rather the nine-month recovery effort to locate the many missing victims. The Ground Zero Museum Workshop is the winner of three TripAdvisor awards: Top 25 Museums in the USA, Traveler’s Choice and five-time Hall-of-Fame Certificate of Excellence honors. Great, interactive tour. You are provided with a set of bose headphones and over 100 exhibits to ponder at and listen to the photographer's story behind their meaning and significance. It was quite moving, especially the section about the dogs that helped out. The biggest piece of glass found within ground zero is here, and its quite incredible to look at! I received confirmation for this trip on my phone, and assumed since there is only one 911 Memorial, there was only one tour. When time approached for the tour, four friends plus myself, took the subway from our hotel to Ground Zero and got in line to get our tickets. It was there we learned our voucher was for an entirely different tour, that required us taking a subway several blocks and for which we were already late. We opted to stay at the Memorial and take the tour there. The GZMWT called me and was very understanding, offering to reschedule for the following day. That option sounded best until we realized our last and final day of our short weekend trip would be spent at another study of Ground Zero. We opted to skip the rescheduled tour in order to take in some different sights. I telephoned GZMWT and Gary was extremely cordial and offered to mail me the gift they provided, even though we would not be attending. Maybe on a subsequent trip we will have opportunity to experience the GZMWT. The Ground Zero Museum Workshop space was much smaller than expected. In about 1000 sq.ft. of space it had an amazing collection of exclusive photos taken during the clean-up of the ground zero devastation. Each photo was accompanied by a moving audio description of the image by the photographer. The space also included a number of artifacts found at the site. We did not know what to expect before visiting the Museum but found it to be an engaging and moving experience. Absolutely outstanding. Very informative and a true reflection of what happened after the event. Real life stories. Extremely moving. A definitive must. Highly highly recommended. Don't bother. It's no where near the memorial site. It's a small room full of photographs, most of which are in the official museum. It was all rather awkward and uncomfortable and amateurish to be frank. We had a wonderful experience at the Ground Zero Museum. The young man running the tour was a pleasure and we enjoyed being able to appreciate and pray for all of our FDNY service men and women who did such an important job on that horrific day. We are humbled by their great losses and heroism. I visited here in August 2016. We had visited the 9/11 Memorial and Museum and the 9/11 Tribute Centre but this was a completely different experience. The girl working the day we went was very welcoming and professional. We arrived about 15 minutes after the start time and didn't think we would be let in but she was very accommodating and even let us have extra time at the end so that we were able to see everything. I cannot praise her highly enough. I would definitely recommend this workshop. Very interesting, was good to hear the story of how things unfolded and what it meant to so many people and how people helped . Sad but worthwhile.